Don't you love how the simplest of things can spark the most creative play in kids? This was part of the principle behind the Taracea sculpture by Spanish arts project Pink Intruder. 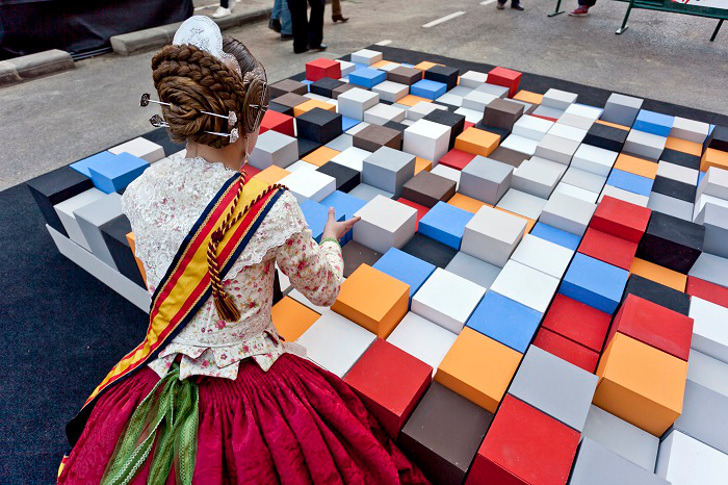 The interactive sculpture was set up in a public space in Valencia, and then the artists stood back and let the local children take over. Taracea was conceived as an urban sculpture to be touched by kids: as a crossover between art and the playground. The Spanish word taracea translates into English as inlay or marquetry, and this traditional decorative technique is a recurring theme in Pink Intruder’s work. In this incarnation, the artwork was made of a multitude of colored wooden boxes, each one filled with objects that made a sound when the box was moved. In keeping with the elegant simplicity of the project, the artwork rested on four low-profile tables, making it easy to move around. Children were then free to reconfigure the brightly colored cubes into any shape they liked and that gravity allowed. Pink Intruder particularly like “urban interventions” as an artform as they feel “the urban space is the ideal place to generate debate” and involve the viewer directly with the work, free from filters and third-party moderation. Pink Intruder said of the April 2015 presentation: “From that moment the game started, we were not more in control of what was happening. Only kids and their playing. It was a toy not a sculpture anymore and the street kids’ property.” It looks like a whole heap of fun to us! Taracea was conceived as an urban sculpture to be touched by kids: as a crossover between art and the playground. The Spanish word taracea translates into English as inlay or marquetry, and this traditional decorative technique is a recurring theme in Pink Intruder’s work. In this incarnation, the artwork was made of a multitude of colored wooden boxes, each one filled with objects that made a sound when the box was moved. In keeping with the elegant simplicity of the project, the artwork rested on four low-profile tables, making it easy to move around. Children were then free to reconfigure the brightly colored cubes into any shape they liked and that gravity allowed. Pink Intruder particularly like “urban interventions” as an artform as they feel “the urban space is the ideal place to generate debate” and involve the viewer directly with the work, free from filters and third-party moderation. 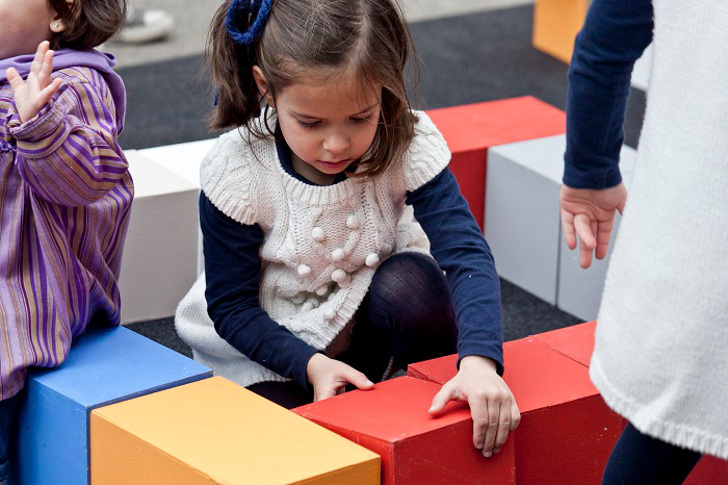 Taracea�was conceived as an urban sculpture to be touched by kids: as a crossover between art and the playground. The Spanish word taracea translates into English as inlay or marquetry, and this traditional decorative technique is a recurring theme in Pink Intruder's work. In this incarnation, the artwork was made of a multitude of colored wooden�boxes, each one filled with objects that made a sound when the box was moved.